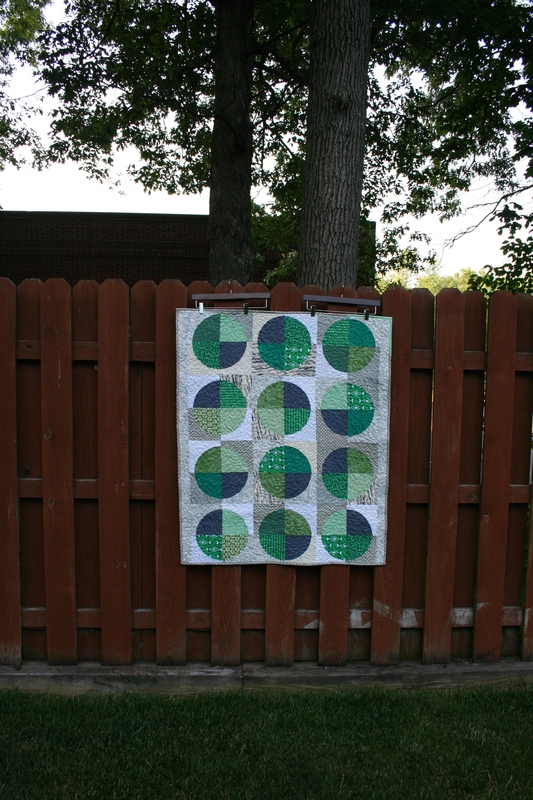 This quilt’s story appears pretty straightforward from the beginning. 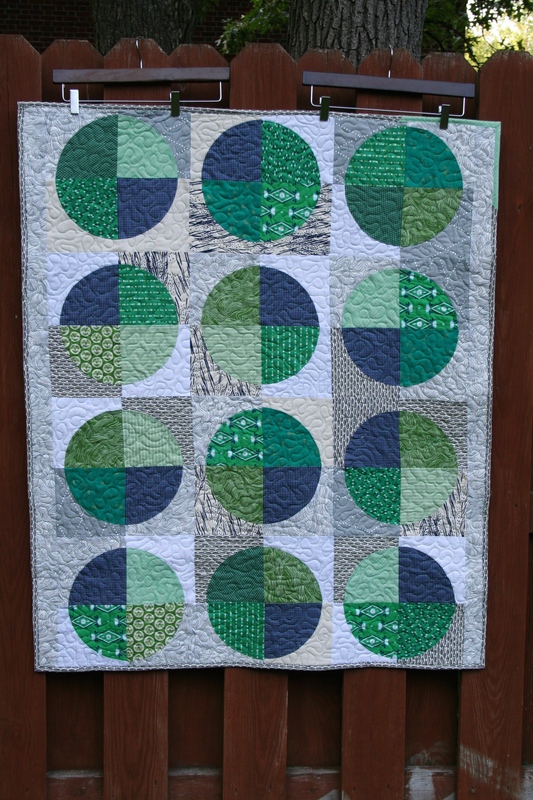 My newest nephew was born on June 22, and I planned to make him a quilt with lots of green, as requested by his mother, my sister. I loved You Are My Sunshine so much that I decided to make it with greens and navy. The whole thing came together in about a week and a half. Huge thanks, as always, to Woody the fence for holding the quilt. It’s a traditional Drunkard’s Path block with strategic fabric selection (more about that here). But each quilt has its own story, and this one surprised me. The things that I was most excited about, like the background fabrics, came together well, but not with the satisfaction that I was expecting. The colors are gorgeous, but they’re exactly how they looked in my head. There was beauty, but no discovery. The back, however, was where the joy made its way into the quilt. Now, I love the Drunkard’s Path blocks, but the templates that I’ve been using create a fair amount of waste. I have to cut a 6.5″ block for each pie piece AND each “crust.” Then I cut the shapes with the templates and end up with oddly shaped scraps. After sewing the top together with so many curves I was craving corners and squares. And I realized that almost all of these beautiful prints would work in small pieces. I wanted to mix them all up into crisp patchwork. So I did. I may have forgotten to square up the quilt completely. That does not in any way affect its awesomeness. 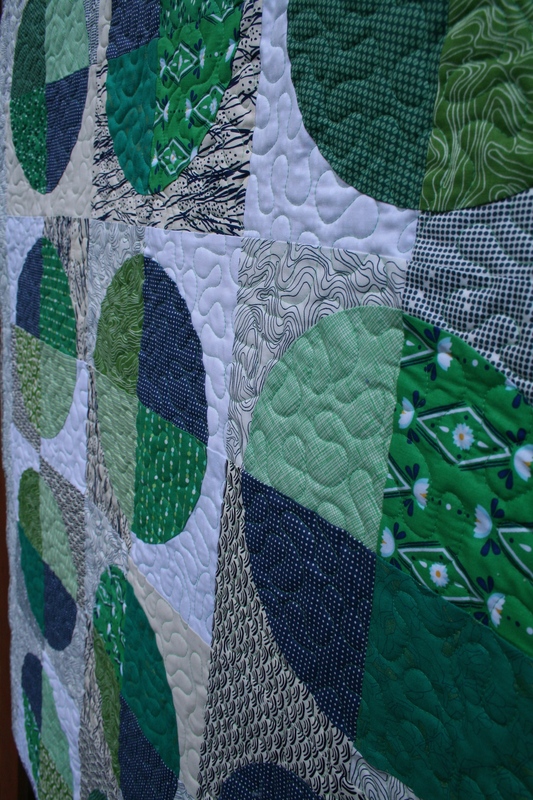 And that’s when I fell in love with the quilt. I’m so happy that it will be in a home where I can visit it often. It was so unexpected and in the end I was just doing what made me happy in the moment. I ditched my plan and stitched the love and joy right into the back. Listen to your gut, people. It’s always right. 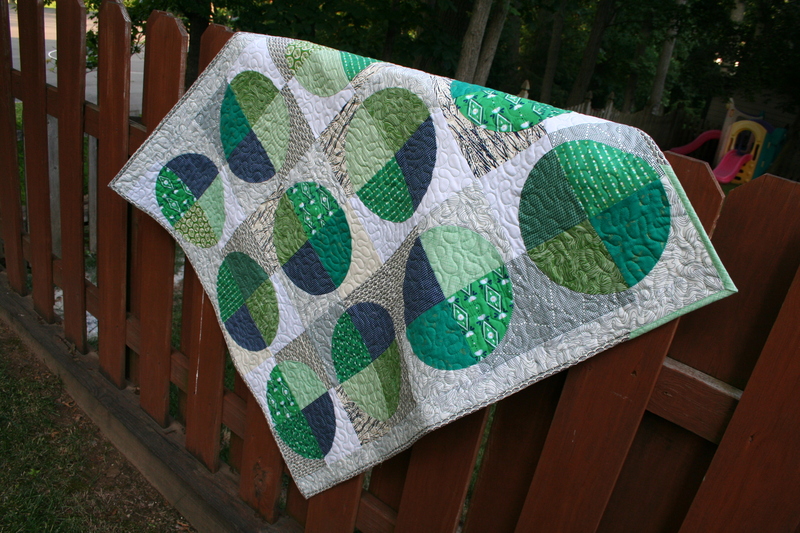 The quilting is an all-over free motion stipple. 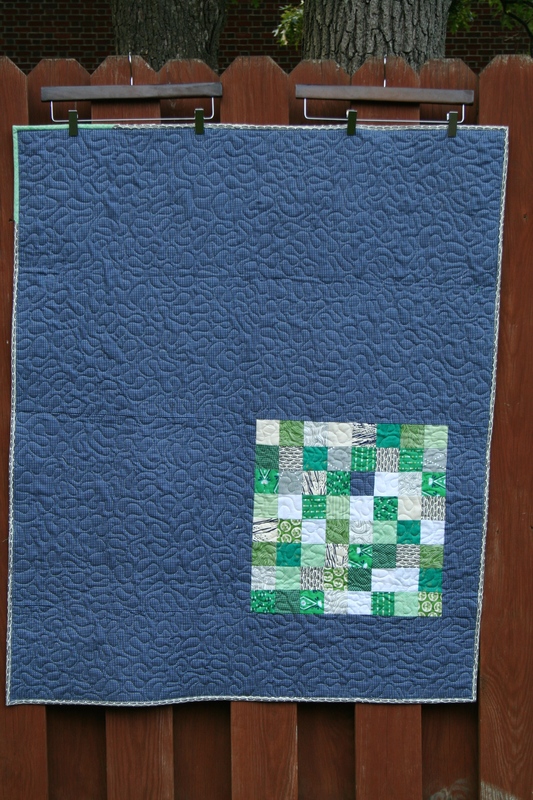 I used Aurifil 2860 (Light Emerald) on the top and 5007 (Grey Blue) on the back. Both are from the Botanics thread collection, and it works so well with the fabrics, several of which are from Carolyn Friedlander as well. The binding is one of my all-time favorite fabrics, Smile and Wave in Navy from the Koi line by Rashida Coleman-Hale for Cloud 9 Fabrics. I am very very proud of this particular binding, partly because I decided to try cutting my strips at 2.25″ instead of my usual 2.5″ and it worked beautifully. The other reason is because I put a little bit of crosshatch in green along one corner. I love the way it looks. It also subtly points to the one block with no navy. I love when there’s one misfit block in a quilt, however drastic or minor the differences are. Thanks, as always, for visiting and checking out my quilts! It is a lovely quilt! I love all the little details in the back and binding. This is an awesome quilt. And green is so under-rated. Awesome job and congrats to your sister!